I empathize with Yahoo, back in my own corporate days, I remember the strong disdain we had for Microsoft, locking in companies with poor technology, nonexistent interoperability, and shoddy business practices. Microsoft WAS the enemy no doubt about it. But come on Yahoo, you are supposed to be leading the industry, so let's have some vision here and not confuse what WAS and what WILL BE. In fact, lets not forget history. What was it that took Apple from dominating the original PC industry to letting Bill Gates and Co take the reigns and rule for the next 20 years while Apple got relegated to it's token 2% of the market share (recent iPod and iPhone success not withstanding)? Obviously there were lots of Apple mistakes, but at it's core, Apple fundamentally thought that their enemy was IBM and not Microsoft. At least back then Apple had a lot more in common with Microsoft then IBM and they let the cultural differences cloud their judgment to think the historical juggernaut of IBM was a bigger threat then emerging ambitions of Microsoft. The parallels here are too obvious, if Yahoo was going to play hardball with Microsoft's takeover bid, because they had some far reaching vision on independence that could have gone head to head with Google that's one thing. But yesterday's announcement show's they had no clue, and fought off Microsoft's bid because of emotion. Where Apple once gave Microsoft the "keys to the kingdom" because they (thought they) needed a killer app to beat the IBM platform, so too we have just watched history repeat itself as Yahoo has given away it's own key's to the new kingdom. Jeremy Almond is the founder of the San Diego based startup company Travature a personalization and recommendation platform for travel information. Before starting Travature, Jeremy was the enterprise architect at Veeco Instruments, the leading provider of nanotech equipment. San Diego based mTracks, today received another 500k in funding from angel investors, making their total funding up to 1M. Not too shabby of a start without getting VCs involved. Though to be honest until I saw their press release, I hadn't heard of them. And looking at their traffic, not too many people have either. 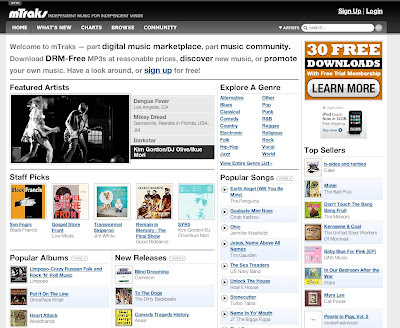 So what is mtrack, well is basically a music social network, combined with a music storefront. Sort of like a combination of imeem and the itunes store. Its got all the usual groovy social features that meld well with music, as well as storefront that has a whole bunch of basically indie music. They don't have the major labels, but it doesn't seem like thats what they are going for. They have quite a few things going for it, particularly a really really good interface. I also like that their music is all encoded in 192k DRM free mp3s (which would have been a huge thing a year ago, but is now becoming sort of a norm). Businesswise I also think they have a good thing going building a site that basically musicians can circumvent labels and in the long run self sell (ala cdbaby). This is definetly good for the artists, giving them more control financially as well as allow them to market better with the social network. I did have some problems though, first the site was occasionally slow, though its hard to say if it was a basic hiccup on their end or a larger problem. The other thing was that although they say they have about 800,000 I (and I'm assuming most 'common' music listeners) weren't entirely familiar with much of the library. Thats cool, and part of the indie music discovery process, but a couple of things need to be tweaked a little to help people like me find my way. First, I really like that if you put in the name of a common band, if mTraks doesnt have the band, it will suggest similar sounding artists in the library. This is exactly what is needed, however my experience is that the suggestions weren't all that close. The premise is good, they just need to tweak the algorithm more. The other thing, is that while I don't mind 30 second clips on Itunes that much, I find that I have a feel for the band better, so its not much of a problem. Here, since I was discovering a lot of new bands for the first time, I really wanted to hear more of the song. Of course I realize a lot of that is up to the negotiations with labels and artists, but for indie stuff, 45 or 60 seconds would have been a lot more helpful. Overall, though I really like the site, the question is just how to make it stand out. These guys need traffic in a serious way. They've done pretty well on the tech side and really now its a matter of figuring out how to standout in a very crowded space. This is no easy task, and I'm assuming thats in large part what this next chunk of funding will go towards. Maybe some kind of killer facebook or myspace app might do them some good. A quick browse of these sites shows that the all have strong niche traffic, though none are doing anything particularly interesting. This seems to continue to follow IBs strategy (or lack there of), of buying community driven sites with little technological innovation. While having a slick web 2.0 feel is not a prerequisite, I still wonder if IB is buying assets that ultimately are going to lose their community to cooler places. Maybe the intention is supposed to be that IB will bring the funding in, so these new acquisitions have some financial flexibility to grow, but frankly a look at IBs portfolio, just doesn't show that happening. Yes, I know I've been covering a lot of conferences and events lately and haven't had a chance to do any in-depth startup profiles recently. But I've got to say a lot of the events we've had lately have been fairly top notch, and remind me more of the scene up in Silicon Valley, then the typical scene down here in Socal. CommunityNext I thought was pretty good, particulary the Robert Scoble and Pete Cashmore conversation. Then the MashMeet after party with Pete and crew was one of the best LA mixers we've had to date. This is all further proof, of how hot the southern california scene is; clearly starting to organize in a meaninful way, now that we are largely recognized as being the largest area for venture capital in the country, second only to silicon valley. Medmania: a new media company with a network of vertical media web properties. Girlgamer: an online community and zine for girl gamers. Mego: digital expression by way of an interative portable profile (basically cool avatars). Streamy: social news aggegator with a great interface. I attended Dealmaker LA event last night and would like to say that it was a very good event. There were tons of startups, VCs, angels, attorneys, bloggers, high profile tech gurus (Pete Cashmore of Mashable), and advisers in attendance, which is no surprise seeing as the event was hosted in Santa Monica's Clear Stone Venture Partners. The premise behind the event was a small and select group of startups were able to run their pitches by 10 different VC's in a "speed dating" session where each session lasted 5 minutes. After that it was a typical tech schmoozing party that was open to the public where everyone exchanged business cards and talked...and talked. Black Closet: A fashion site that lets you see what designer clothes looked like matched together on a model, there business model was the most intriguing part of their business. Call Fire: A VOIP company that has already surpassed $1 million in revenue. Travature: A travel startup with an intriguing value add proposition. HeavyBag Media: A Marketing firm whose goal is to build community around a company or product. Overall I had a great time here and thought this event was a notch above many of the other events that have been going on in LA this week. For now I am going to take a break until the next big LA tech event. Which incidentally starts in 15 minutes. Los Angeles Based Myspace is finally trying to catch back up on the innovation curve by releasing their apps platform today. 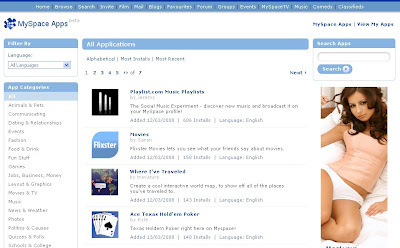 These apps, much like the Facebook, apps, allow social widgets on your myspace profile. And while Facebook has beaten Myspace by almost a year with this functionality, there are some things to applaud Myspace over. Most of important of which is that they are the first container to go live with the much touted OpenSocial specs. Social Music Playlist that help you discover new music and broadcast it to your friends on your profile. Helps you discover movies by showing you what your friends thought. Create an interactive world map, to show off all of the cities, states, and countries you've traveled to. (Incidentally this app is made by San Diego based Travature.com, a travel 2.0 company we'll probably review in the next couple of weeks). Sync your myspace mood status or other updates with twitter. Overall, while I'm usually a Myspace hater, I'm actually impressed with how they came out of the gates here. While theres been pleanty of opensocial hype, myspace didn't send out big press releases about launching soon like some other containers, they just built the development community, got the apps working with opensocial and then just launched. Thats the way to do it. And at least for the moment, the apps not only work pretty well, they seem free of the facebook spam. Now thats a change, Myspace being solid, and better at spam then Facebook. We'll see how long this lasts. Last week one of the bigger web 2.0ish conferences was in Southern California: The Oreilly Graphing Social Patterns, held in San Diego. I had some passing involvement there and after digesting it a bit, one of the things that I came across thinking was that it never ceeses to amaze me how traditional companies are clueless to what the social web is all about. So many companies are not sure that they "get" social, but are being told by people in the know that they "need" social. What this often means to them seems to be two extremes: either you must be a company knee deep in community by becoming some up and coming niche social networking site (enter pitch for online community of garbage men here) or that social should just be haphazardly bolted onto the top of your existing product (your chair company makes a vampire biting facebook app that eats chairs). But clearly neither extreme is a way to add value to your product/service. And maybe even more importantly, social on its own, doesn't necessarily monitize. What does add value AND monetizes, is the notion that social is the new and obvious enabler, of existing markets. Most business are not likely to fundamentally change by being social, they just become better at the business of connecting with and between customers. Movie sites like Blockbuster or Netflix are great examples of this. The companies are still fundamentally about movies, but social takes the customer experience to a different level because you can show off the movies you're watching, connect with friends who have similar taste in movies, review what you've seen so you get better suggestions for new movies, etc. Regardless of whether you are on one of their facebook or opensocial apps, or you are in the community section of their own site, the social graph has become a core enabler of movie watching. These activities enhance the entire video business because you now are not just watching the movie, but you also are stay engaged before and after. In this way community doesn't change the business, but instead drastically creates more value to the lifecyle of the business. In this way as we move forward, social to me becomes less about being the next cornerstone block of a company, and more about being a fundamental component entrenched in nearly all online activity. Social Vibe, recently closed over $4 Million in their series A funding round last month. They are located in Hollywood and have the two things every good web 2.0 start up needs; 1) a slick looking site and 2) a very interesting idea. The main premise behind their idea is having users of Myspace and Facebook get their social networking pages sponsored and in return they get a chance to win prizes or give money to charities. You get points according to how active you are on a social network, how popular you are, and how many people you get to join the social vibe community. If you think about this for a second you will see that if you have a very active social vibe community it would be very very viral. Also on the plus side they did a good job of making the ads or "sponsorships" cool looking (ie they are not blinking banners for saying you are the 837,487 customer and have won and new laptop), and as a bonus they allow you to donate your points to charity. I do reserve some questions for their business model the first being; why entries to win a prize? I get offers to enter contests for free all the time, whether it is dropping my business card in the free lunch bowl or the previously mentioned ad for my chance to win a laptop and I know one thing...I don't go near any of them. I realize that here the odds are better, but I do not like working for a chance to win a prize, I think it would be more motivating if this worked in a fashion where you can exchange your points for definitive prizes even if it would take longer to get to the good prizes. Or maybe an even more novel idea just let the people exchange their points for some cool hard cash (although I do realize this could be difficult to implement legally if minors wanted to use the service). My next bone to pick is with the charities, people love all sorts of charities for different reasons whether it is Save the Whales or Safe Haven for Donkeys in the Holy Land (click the link I did not make that up). The point here is that people like charities for different reasons, I am sure Socialvibe knows exactly how much a point converts to monetarily so why not just let the user donate to whatever charity they desire. However I will admit that they do have a wide range of quality charities covered. My overall impression here is that this could be huge, everything Social Vibe does looks slick and I could really see people adding these advertisements, widgets, and videos to their social network pages in order to gain a chance at some prizes. Furthermore if this does catch on and people are not as anti-raffle type contests as me the whole scheme is viral enough to spread all over the most popular social networks in no time at all. PreCYdent is a legal research tool that I am very excited was submitted for review. The idea behind the site is to enable everyone (not just the legal community) to search and find both case law and statutes for all matters. They are headquartered in San Diego, CA and have recently opened up the early alpha version of their software. Funding for the company is undisclosed. The current state of legal research has two major players Westlaw and LexisNexis, Westlaw being the dominant force. It is practically necessary to have access to one of these two software programs to do useful legal research and both of these services individually license their product using heavy price discrimination which is downright exorbitant at times (often). Furthermore while the traditional software of Westlaw and LexisNexus is great at looking up cases which you have the citation to (a citation is generally how you find a case) as well as following the cases subsequent history (was the ruling upheld?, overruled?, is there conflicting law?) it is borderline useless in a generic word search (i.e. it is difficult to type in "lemon vehicle private party" and find out cases or statutes pertaining to lemon laws and private sellers of automobiles). In summary most lay people could not afford or efficiently use the major tools for legal research. PreCYdent seems to be running on 2 main platforms, making their service able to effectively understand searches for words and to be free for all. These are both lofty targets to set your site on for this industry, with that said they both need to be accomplished ASAP. To make their word search tool understand what you are looking for they use a combination of an algorithm and user response (almost like Mahalo but with a defined niche for legal cases and statutes). In the few searches I ran I had significantly better search results with PerCYdent than that of Westlaw or LexusNexis, however my results were far from perfect. This can probably be attributed to PreCYdent only having indexed U.S. Supreme Court cases, and Court of Appeals cases. There are other features offered on the site such as "finding lawyers," and "answering legal questions," but the community does not appear to be developed enough to make this useful, yet (they are still in Alpha mode so I will give them time). In short PreCYdent offers a very innovative idea and a useful tool which could enable all people to find the law and use it themselves. However if they are to become a dominant player in the market they have a lot of hard work ahead of them (including the active indexing of ALL cases). If PreCYdent can make legal searching both better and free they will have the ability to revolutionize legal search as we know it not to mention monetize their search traffic rapidly. All in all they have a great concept the only question will be if they can pull it off. San Diego based, Divx, best known for the popular mpeg4 licensing business, today announced that they are shutting down their Stage6 video sharing website. This has rightly gotten a good bit of play in the blog technosphere (see Techcrunch, Gizmodo, GigaOM, Webware, Mashable, Etc), as Stage6 was a pretty popular service. I personally used Stage6 all the time as it was a good source of content (both original and piratted), and felt quite superior to your typical Youtube knockoff, both in terms quality and speed. According to their official blog response the reason for the shutdown was "that the continued operation of Stage6 is a very expensive enterprise that requires an enormous amount of attention and resources that [they]are not in a position to continue to provide." Of course as Techcrunch and some of the other blogs have dug into, when they passingly mention that "there are a lot of other details involved" what they really mean is that a rediculously stupid power trip originating from the Divx board over how to properly spin off the new company was a huge problem. As Arrington put it, "throwing the baby out with the bath water" was certainly the case here. Stage6 had impressive funding to branch off and a business model that was actually working. Throwing out the revenue that Stage6 was making, as well the positive consumer impact it had on the Divx brand because they didnt have the resources to devote to it or the stomach to pound through the internal politics is amazingly short cited on their own. Even just considering Stage6 as its own entity its pretty easy to see that they come out of the gates with great traction and a semi niche, both of which any one of the new video sharing sites we see pop up daily would kill to have. Overall on the business end this whole thing just exemplifies bad leadership and decision making. Plus as a consumer, I have just got to say I'll be sad to see Stage6 go.